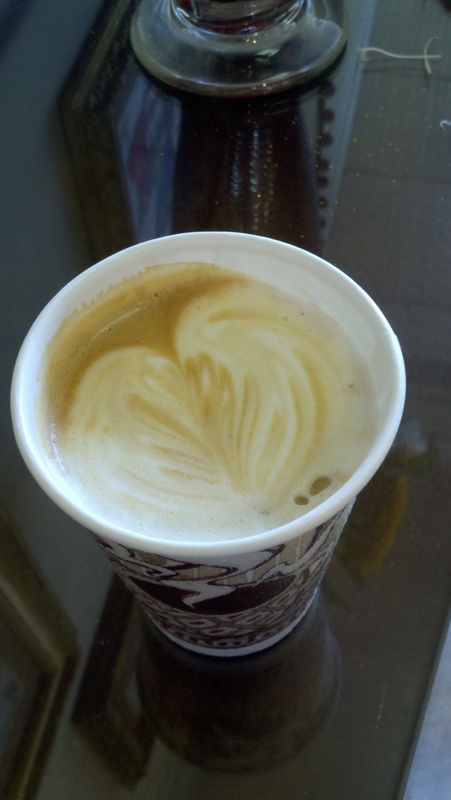 A lovingly made cup of latte from Daily Roast in Eureka Springs. still waking up and the search for coffee is easy and sitting down for a latte at Daily Roast is a safe quiet place to get your bearings. At the Daily Roast you can count on Jim and Janet to stand behind the counter with smiles and offer up the latest sweet treat… maybe a beautiful little yellow lemon pound cake, warm banana nut bread. Today it is crumbly pecan coffee cake. Daily Roast does just what their name says. It roasts its own fair trade, organically grown coffee beans and like their sign says….”its all good”. If you are the type who eavesdrops, you will likely hear some fascinating conversation here… anything from the latest local rant (a petition to ban cell towers or issues surrounding the amazing number of deer roaming the town) to the latest BBC special with some Washington politics mixed in. 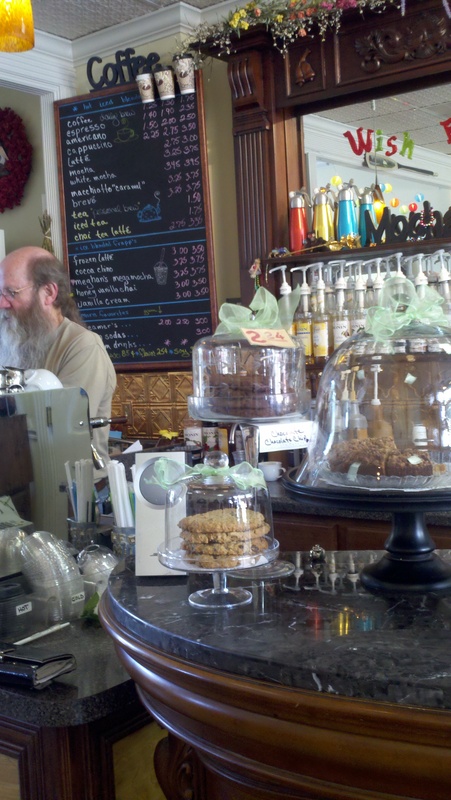 Jim will make your coffee at the Daily Roast in Eureka Springs. flows into the streets around noon as the sidewalks start to fill up with people. 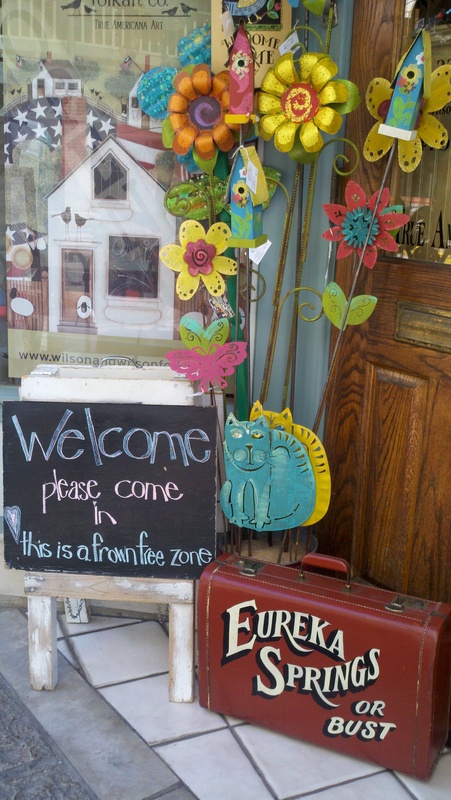 Shopping in Eureka Springs has a way of altering how you think about time. Things move at a slower pace here. Shops open around 10am and close when they close. This may be unusual for folks coming from the city but here, everything is done with a casual reference to deliberate living. Locals express a never-ending interest in where people come from. It’s a sweet curiosity and most people find it extremely endearing. Eureka Springs downtown shops are fun. trendy even kitschy antiques, local art and more. Eureka has an eco-friendly and philanthropic conscience. Shops like Crazy Bones and Christopher’s carry popular name brands but emphasize products that are green or give back. See more photos of downtown shops on Facebook. Shopping in downtown Eureka Springs can easily fill one full day. At the end of the day, you still have options. By then you will have survived the proverbial feast for the senses and endured the steep sidewalks. You have earned some time in the spa, a glass of wine while enjoying the mountain views, a dinner prepared by world class chefs, or a night dancing to live music. Whatever option you chose, at the days end you are sure to find yourself wrapped up in a big comfy bed in a cabin secluded by trees or a mountaintop resort. Read more about how to get around in Eureka Springs once you arrive. As I mentioned, Eureka Springs is full of options. Visit the Official Website for the Greater Eureka Springs Region and explore your lodging, dining, shopping, nightlife, and attraction options. See the Calendar of Events to help plan your trip and find last minute deals on the Official Eureka Facebook and EurekaSprings.com partner…ReserveEureka.com. This entry was posted on August 22, 2011 by estcblog in Fun Downtown, Shopping, Things to Do and tagged coffee, food, historic downtown.